Few creatures inspire greater awe than dragons, and Pathfinder Player Companions: Legacy of Dragons dives into the ripples left in these mighty creatures' wake. Whether they help or harm, dragons make a lasting impression from the legends and philosophies they inspire to the bloodlines they foster. New archetypes ranging from the dragonheir scion to the wyrmwitch, allowing players to access draconic appearances as well as lore, powers, and spells. Ways for characters to enlist drakes and lesser dragons to serve as allies, improved familiars and even flying mounts. New draconic bloodlines for bloodragers and sorcerers, allowing eldritch abilities based on esoteric imperial, outer and primal dragons. 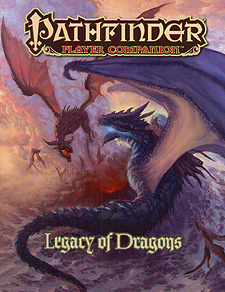 This Pathfinder Player Companion is intended for use with the Pathfinder Roleplaying Game, but can be easily incorporated into any fantasy world.